Aren’t meant for production use. May be available only in selected geographic areas. How do I enable a preview feature? To enable a preview feature, you must be a Customer Engagement administrator. Select System Settings, and then select the Previews tab. Read the license terms, and if you agree, select the I’ve read and agree to the license terms check box. For each preview feature you want to enable, select Yes. How do I report an issue or provide other feedback? 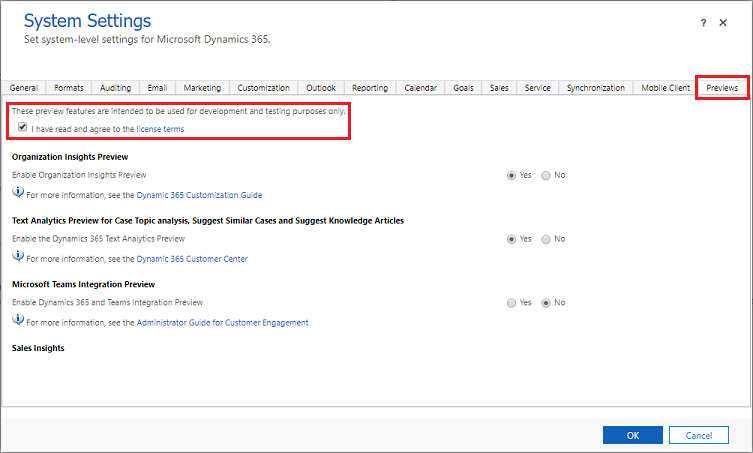 If you’d like to provide feedback, offer suggestions, or report issues for a preview feature, please go to Microsoft Dynamics Ideas. This website provides a collaboration platform for gathering actionable feedback to build and improve products and services.